Getting oil to market is a process that requires various transportation and storage technologies, usually referred to as “midstream”. Oil is often produced in remote locations away from where it will be consumed; therefore, transportation networks have been built to transport the crude oil to refineries where it is processed and to ship the refined products to where they will be consumed (like a gas station). Storage facilities are used to balance supply and demand of oil and refined products. 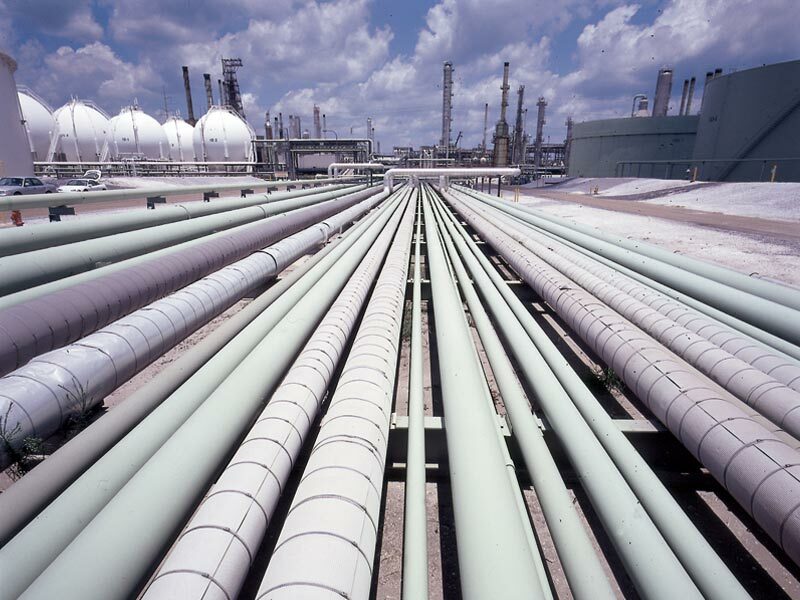 Pipeline – the most commonly used form of oil transportation is through oil pipelines. Pipelines are typically used to move crude oil from the wellhead to gathering and processing facilities and from there to refineries and tanker loading facilities. Pipelines require significantly less energy to operate than trucks or rail and have a lower carbon footprint. Rail – Oil shipment by train has become a growing phenomenon as new oil reserves are identified across the globe. The relatively small capital costs and construction period make rail transport an ideal alternative to pipelines for long distance shipping. However speed, carbon emissions and accidents are some significant drawbacks to rail transport. Truck – while the most limited oil transportation method in terms of storage capacity, trucks have the greatest flexibility in potential destinations. Trucks are often the last step in the transport process, delivering oil and refined petroleum products to their intended storage destinations. Ship – where oil transport over land is not suitable, oil can be transported by ship. A typical 30,000-barrel tank barge can carry the equivalent of 45 rail tank cars at about one-third the cost. Compared to a pipeline, barges are cheaper by 20-35%, depending on the route. Tank barges traditionally carry petrochemicals and natural gas feedstocks to chemical plants. The drawbacks are typically speed and environmental concerns. Oil is stored in above-surface tanks. The oil will then be placed there until ready for transportation. While there are various transportation options for oil, the decision of which method to use usually comes down to cost and location. Short distance transportation is usually done by feeder or distribution pipelines and, in some cases, trucks. When land routes are unavailable, tankers are the only option for delivering oil to market. Short distance transport can be achieved using railway, trucks, or pipelines. Trucks are less efficient than other methods, but their particular advantage is that they provide direct travel from the source to the destination. Direct transportation is also a benefit of pipelines and tankers. In contrast, railway cars must be detached and processed at stations. Moreover, they may require jumping through multiple routes, making the process more complex from an administrative standpoint Vanek, F. M., & Albright, L. D. (2008). Energy systems engineering: Evaluation and implementation. New York: McGraw-Hill. Vanek, F. M., & Albright, L. D. (2008). Energy systems engineering: Evaluation and implementation. New York: McGraw-Hill. Vanek, F. M., & Albright, L. D. (2008). Energy systems engineering: Evaluation and implementation. New York: McGraw-Hill. Vanek, F. M., & Albright, L. D. (2008). Energy systems engineering: Evaluation and implementation. New York: McGraw-Hill. . In the near future, it can be expected that these transportation methods will continue to be used, unless a radically new method of transportation is found. Therefore, most of the technology development in oil transportation methods is aimed at reducing emissions, increasing efficiency, or preventing spills and leaks. An important issue that oil transportation and storage methods face are spills and inadvertent emissions. Spills from tankers can pollute coastal environments, while spills from rail and pipelines can pollute wildlife habitats or populated areas depending on the location. Spills or gas leaks from storage tanks have the same harmful effects. Pipelines have more recently drawn a great amount of public concern. Proposed pipeline projects, such as the Keystone XL, have been the focal point of environmentalists because of their potential environmental impacts and as a symbol of society’s continued investment in carbon-intensive energy infrastructure. Sorry, we do not yet have a video specifically for Oil Transportation. We are adding new videos to StudentEnergy.org weekly, but in the meantime check out this video on Oil.